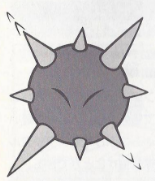 Sparkies are Spark-like enemies from the Game Boy game, Wario Land: Super Mario Land 3. Only two of these enemies appear in the whole game, in the third room of Stage 1-5, Rice Beach. They cling and crawl on the walls and ceilings, trying to hit Wario. Chikuri From chikuchiku, an onomatopoeia describing an acute stinging pain. ↑ Nintendo Power Volume 58, page 80. This page was last edited on January 16, 2019, at 13:31.